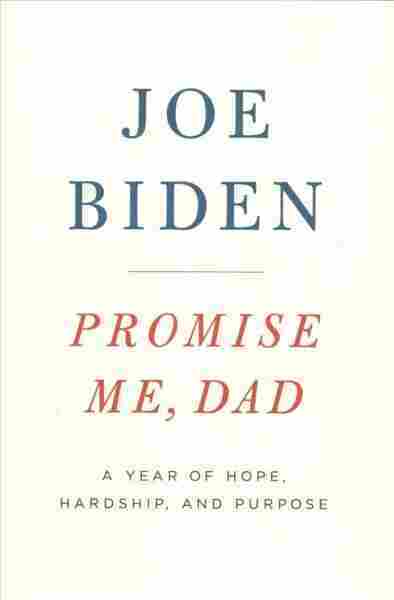 Review: Joe Biden Book 'Promise Me, Dad' Keeps The Door Open For A 2020 Run The former vice president is out with a book that recounts in heart-wrenching detail his son Beau's diagnosis and death from brain cancer — and his deliberations about running for president. 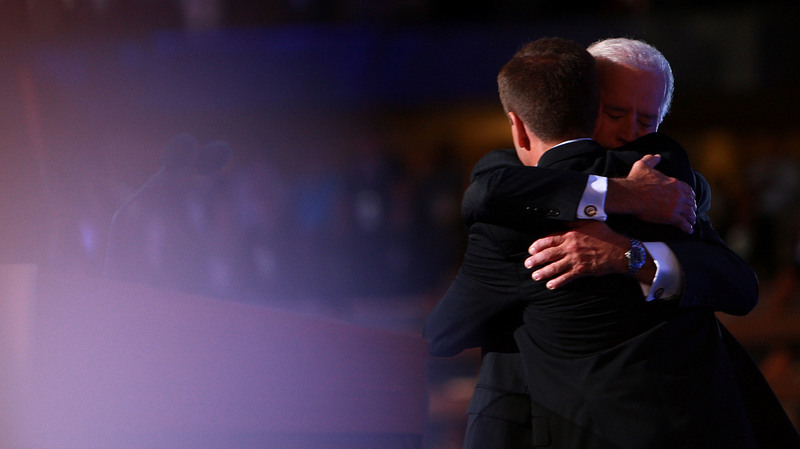 Joe Biden and his son, the late Beau Biden, embrace at the 2008 Democratic National Convention in Denver. Beau Biden delivered the keynote address that year. He died seven years later from brain cancer. It hit him one day riding his bicycle on the hard sand at the beach during a family vacation. He had taken this ride plenty of times before. But this time was different for Joe Biden. "And it was like I could hear him talking to me again. Dad, let's stop and sit down. I got off my bike and found myself standing at what felt like the edge of the earth — just ocean and beach and woodlands. It was magnificent. I found myself overwhelmed. I could feel my throat constrict. My breath came shorter and shorter. I turned my back to the agents, looked out at the vastness of the ocean to one side and the darkness of the woods to the other, sat down on the sand, and sobbed." That's how the former vice president closes Chapter 10 of his new book, out Tuesday, Promise Me, Dad: A Year of Hope, Hardship, and Purpose. Biden recounts in vivid, heart-wrenching detail what it was like for him and his family from the time his eldest son, Beau, a rising star in the Democratic Party, was diagnosed with brain cancer, to his death less than two years later and the aftermath. It's hard not to feel for Biden, who exudes humanity throughout the book. He lays bare his emotions and vulnerabilities at losing a son with so much promise, which is made even more difficult by the understanding that Biden has faced unthinkable tragedy before. As almost anyone reading this likely knows, when he was first elected as a U.S. senator from Delaware, Biden's young wife and daughter were killed in a car crash. His sons Beau and Hunter, 3 and 2 at the time, were in the back seat. They survived but were hospitalized for days. Joe Biden had just turned 30. And now, four decades later, he was losing Beau, his trusted adviser. Biden writes that he was "pretty sure" Beau could have run for president one day. Biden describes Beau — who was attorney general of Delaware at the time of his diagnosis and set to run for governor — as like him, but better. "Beau Biden, at age 45, was Joe Biden 2.0," Biden writes. "He had all the best of me, but with the bugs and flaws engineered out." If former President Barack Obama's book was called Dreams from My Father, Biden's could have been Dreams Of My Son. Biden weaves in his responsibilities as the right-hand man to the most powerful person in the world, then-President Obama, which included a hefty foreign-policy portfolio. It served as a powerful device in understanding just how much Biden was juggling, even if some of the detail about Ukrainian and Russian troop movements felt extraneous at times. Biden was taking calls on secure lines in hospital rooms next to his son's while attempting to understand what was happening to Beau — and trying to keep it all private. The possibility of running for president is a constant thread throughout the book and ties it together. Biden was considering it far more seriously than previously reported, and he had begun planning a run in the summer of 2013, he writes. I was afraid I would be overwhelmed by emotion, and I think the audience could see it. I waved and hustled over to the car. This was no way for a presidential candidate to act in public." Electoral politics is never far behind in Promise Me. The last chapter of the book, in which he reveals why he didn't run, is even titled, "Run, Joe, Run." He takes the reader inside the deliberations, right up to the point of his 11th-hour decision not to run — something that went against Beau's wishes. Biden was actually all set to run. By October 2015, Biden was even editing his announcement speech. It laid out a vision that was different from the grievance politics presented by Donald Trump and Bernie Sanders — and more hopeful than the technocratic plans laid out by Hillary Clinton. He had also assembled a team that was not just made up of his inner circle. It included some top Obama staffers, like communications adviser Anita Dunn and Bob Bauer, one of the top Democratic elections lawyers in the country. He had Obama's Ohio field director, a top South Carolina adviser and a list of people ready to endorse. Even George Clooney volunteered to help with fundraising. Five months after Beau's death, and with Clinton struggling to get past her email server controversy, Biden had some goodwill — and political momentum. But he decided against it. He knew in his heart he wasn't ready. There was the time earlier in the summer, for example, on the tarmac in Colorado, where he was set to speak at a pair of Democratic fundraisers, when someone called out that they had served with Beau. Biden teared up and had to leave. "I felt a lump rise in my throat," Biden writes. "My breathing suddenly became shallower and my voice cracked. I was afraid I would be overwhelmed by emotion, and I think the audience could see it. I waved and hustled over to the car. "This was no way for a presidential candidate to act in public." Having been through this before, he says, he knew the second year can be harder than the first. And if he did win the nomination, he didn't want to put his family through that — even though his family was behind him and pushing him to run. "[W]e all believed I was best equipped to finish the job Barack and I had started," Biden writes. "If Beau had never gotten sick, we would already be running. This was something we would have done together." He adds, "[T]he idea of not running started to feel like letting him down, like letting everybody down." But "grief is a process that respects no schedule and no timetable." This is not a score-settling memoir, but it's clear there's no love lost between Biden and Clinton. Joe Biden looks back at Hillary Clinton during a rally for Clinton in August 2016, three months before the presidential election. Biden writes in his new book he was very close to running himself. Beau wanted his father to run — not as falsely reported, Biden writes, as a death-bed wish. And it certainly was not he who leaked the apocryphal story to The New York Times, he points out, because it wasn't true. The Times eventually appended a formal correction, Biden notes. Instead, Biden suspects the "opposition" — and in this case, that's Hillary Clinton's campaign — of being responsible for the Times story. Some of Clinton's staff had become aggressive in their approach to his team about Biden's intentions, he writes. At first, Biden says, they inquired genially. But as the months wore on, and Clinton's prospects dimmed — with poll numbers between her and Sanders closing in early states — they began to argue that he couldn't win. Finally, they attempted to make the case, as Clinton appeared more vulnerable, that Biden would wind up splitting the vote and handing the nomination to Sanders. Could Biden Make A Presidential Run In 2020? Even former President Bill Clinton, who had once praised the 1994 crime bill that Biden authored, was "now calling [the bill] a big mistake," Biden writes. In reality, Clinton was getting pushback on the campaign trail from Black Lives Matters protesters, but Biden interpreted the Clintons attempting to put distance between themselves and the legislation as a direct slap at him and a way to show how they could go after his record. None of that intimidated Biden, he says. He writes that he relished the underdog role, and, at age 72, he certainly didn't care what the Clinton machine thought of him. All that mattered was what his family thought. "She and I used to have regular meetings in that room when she was secretary of state and came over for breakfast to get my take on how she was doing with the president. Barack was a tough boss to read, especially for people who didn't spend much time around him, so I think she used me as her Obama whisperer. But Hillary had an entirely new agenda that February morning, and she got right to it." Translation: Obama is my friend, not yours. If that didn't make it clear enough that Biden and Clinton weren't very close, he notes, "I didn't feel like I could tell her the truth about Beau." "I felt a twinge of sadness for Hillary as I watched her walk down the steps that morning. ... [S]he did not evince much joy at the prospect of running. I may have misread her entirely that morning, but she seemed to me like a person propelled by forces not entirely of her own making." Despite his friendship and fondness for President Obama, Biden is fairly convinced that Obama was trying to edge him out of the race. 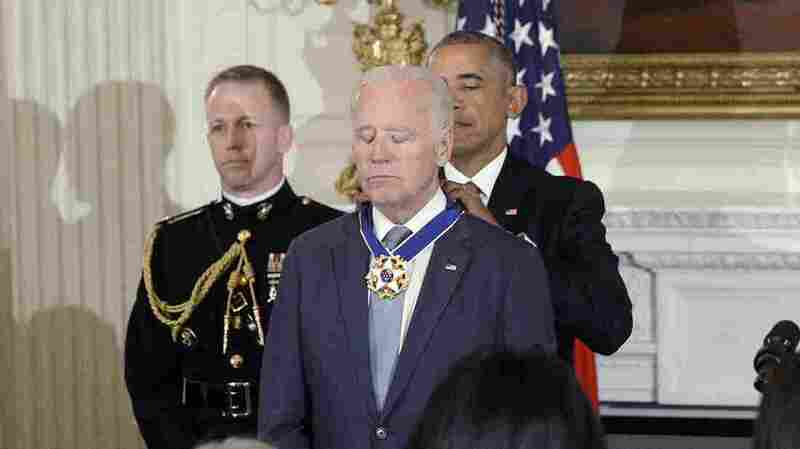 Then-President Obama awards the rare honor of the Medal of Freedom with distinction to then-Vice President Biden in January. It brought Biden to tears. Obama, Biden writes, continued to press him — albeit gently — at their lunches about whether he was running. Obama did so about half a dozen times in 2015, even days after Beau died and more insistently later in the year as the early primaries got closer. Biden says Obama was "convinced I could not beat Hillary" and even asked Biden to talk with his political advisers — some of whom were already working for Clinton — for a reality check.
" 'What are you going to do,' he asked, 'about running.' I explained that I had not entirely set aside the idea of running. ... And then I found myself saying, 'Look, Mr. President, I understand if you've made an explicit commitment to Hillary and to Bill Clinton,' but I assured Barack that if I decide to run I would engage Hillary on our policy differences only and not on questions of character or personality that might weaken her if she won the nomination. 'I promise you,' I said. And we left it at that." That wasn't the end of it, especially as the months wore on, and Biden still hadn't made a decision. Biden takes note that "Barack was seen playing a round of golf with Bill Clinton" on Martha's Vineyard, that stories were popping up with donors saying they were "unifying around Hillary" and "a couple of people on President Obama's political team were telling us the race just wasn't winnable for me." Biden writes that Obama gave Clinton "what seemed like a coordinated, nonendorsement endorsement" when she announced. Despite all that, Biden still seemed determined to run. "Beau believed, as I did, that I was prepared to take on the presidency," Biden writes. "That there was nobody better prepared. No matter what people in the outside world said or thought, Beau and Hunter believed we could win. ... So the 2016 Biden campaign would have a late start. So what? If Beau made it through the next few months and came out alive, I knew we could do this." The scene on the beach took place at Kiawah Island, S.C. Beau had died less than a month earlier. The Biden family had a regular vacation to the island, but there were questions among the family about whether they would make the trip this year given Beau's death. The vice president insisted they make the trip. He remembered from the last time he faced stinging tragedy that sticking to routines and family traditions was important and helpful. "I knew from past experience," Biden writes, "that as hard as it would be, it was better to go through it than to avoid it." The trip to South Carolina, however, was interrupted by a different, national-attention-capturing tragedy. It became what Biden described as "even more of an emotional rollercoaster than I had anticipated." During that trip, the mass shooting at a Charleston church happened, where a white supremacist opened fire and killed nine parishioners during Bible study at Emanuel African Methodist Episcopal Church, known as Mother Emanuel. Biden was just 45 minutes south and decided to go to the scene — and comfort however he could. "The act of consoling had always made me feel a little better," Biden writes, "and I was hungry to feel better." 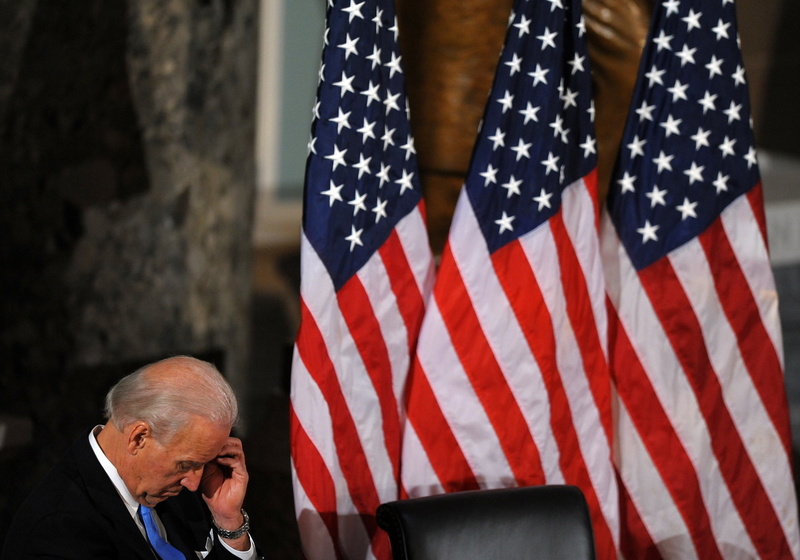 Vice President Biden attends a memorial service in Statuary Hall on Capitol Hill in 2010. Biden takes a certain pride in comforting those who have faced tragedy. "I also know from experience," he told the widow of Rafael Ramos, one of the New York police officers assassinated in their squad car in the aftermath of the Eric Garner killing, in his eulogy, "that the time will come, the time will come when Rafael's memory will bring a smile to your lips before it brings a tear to your eyes. That's when you know — it's going to be OK. I know it's hard to believe it will happen, but I promise you, I promise you it will happen." It's a line he's repeated countless times, Biden writes. He even tells the story of how he comforted the widow and father of Ramos' partner, 32-year-old Wenjian Liu. He gave Sanny Liu, Wenjian's widow, his private number. He told her that when all of the people who are now supporting her go away, she could call him if she needs someone to talk to. Biden writes that he has given his private number to dozens of family members of victims, and some do call. In those scenes, it's hard not to think of how Biden's approach to the grieving differs so greatly to that of President Trump, who recently struggled to console a Gold Star mother and instead landed in controversy. Biden writes that he knew the pastor at Mother Emanuel, Clementa Pinckney. He was a state senator with a bright future. At 41, he was younger than Beau. He was killed that night, as his wife and 6-year-old daughter hid in his office. On his office wall, Pinckney had a photo of him and Biden, smiling together. "Now he was gone," Biden writes. After choking back tears and keeping a brave face through Beau's illness — even forcing himself to smile before rounding the final corner to Beau's hospital room — the weight of it all finally proved too much for Biden. After being at Mother Emanuel, he headed back to Kiawah Island and broke down on the beach. "[P]romise me, Dad, that no matter what happens, you're going to be all right. Give me your word, Dad, that you're going to be all right," Beau insisted to his father before the worst of his sickness hit him. "Promise me, Dad." "I'm going to be okay, Beau," Biden responded. "No, Dad," Beau said. "Give me your word as a Biden. Give me your word, Dad. Promise me, Dad." So will he run in 2020? Biden is writing this book, it seems, for multiple purposes. It's clearly cathartic. He needs a purpose and something to do, as he notes. That's part of it. But he's clearly conscious of the goodwill he received after Beau's death. He notes that he got a lot of attention, more than perhaps he expected, after an emotional appearance on The Late Show with Stephen Colbert in September 2015. That seemed to accelerate his planning for a 2016 run before he realized he simply could not do it. It's not clear what the former vice president wants to do next or whether he wants to run for president in 2020. He will be 77 before Election Day 2020, but he's clearly leaving his options open. And by writing a book — and doing a healthy round of interviews, including with NPR — on the very topic that gave him all that goodwill, Biden keeps his name and the good feelings out there in case he does want to make a run. "What Andrew did express to me that day at the end of July was that his father never truly made peace with declining to seek the presidency. 'Whatever decision you make, make sure you won't regret it,' he told me. 'Because you'll live with it the rest of your life.'" It's worth noting, however, that Biden has run for president twice before. Once in 1988, when he bowed out because of a plagiarism scandal and then in 2008, when he finished fifth in Iowa and sixth in New Hampshire. "Rules for happiness: something to do, someone to love, something to hope for." "[T]he question of running for president was all tangled up in Beau, and purpose and hope. Giving up on the presidential race would be like saying we were giving up on Beau." "So how do I want to spend the rest of my life? I want to spend as much time with my family, and I want to help change the country and the world for the better. That duty does much more than give me purpose; it gives me something to hope for. It makes me nostalgic for the future." Could that be a presidential run? "I'm not closing the door," Biden told NBC's Today show on Monday. "I've been around too long. I'm a great respecter of fate, but who knows what the situation is going to be in a year and a half?" Don't be shocked if he decides to give it a go. After all, as Biden himself has said, "My Mom used to have an expression — she'd say, 'As long as you're alive, you have an obligation to strive, and you're not dead until you've seen the eyes of God.' And the truth of the matter is I think that's the Irish of it."